I’m not a schmaltzy guy. I don’t do sentimentality. I’m too cynical for gooey moments and group hugs. But I do have my weaknesses. And Parks and Recreation is my Achilles heel. That’s not to say Parks is a schmaltzy or overly sentimental show — it’s not at all — but it does have a hell of a lot of heart. In the hands of a lesser creative team, it would be too much. The friendships, the romances, the heartwarming victories, Leslie Knope’s indomitable optimism, it could have all been a mushy, over-earnest mess. However, under the deft hands of showrunners Greg Daniels and Michael Schur — who cut their teeth on shows with equal parts bite and heart, like The Simpsons, King of the Hill, and The Office — and aided by a stellar cast, it all works. Parks gave us seven joyous seasons. Beneath all the jokes, hijinks, and screwball characters, Parks was always a show about friendship — a show about a handful of disparate people who drew strength from one another to grow and succeed both personally and professionally. Over the course of seven seasons, we followed the Parks Crew’s wins and losses, their ups and downs. The real triumph of the series was making us care so much for these people. The performances speak for themselves. The best script will fall flat if the actors can’t sell it. Fortunately, Leslie Poehler, Adam Scott, Aziz Ansari, Aubrey Plaza, Chris Pratt, Nick Offerman, Rhetta, Jim O’Heir, Rashida Jones, and Rob Lowe are easily one of the best ensemble casts in television history. Full stop. The show’s writing team also deserves special consideration. These were characters created and written with love. Comic talents like Norm Hiscock, Chelsea Peretti, Joe Mande, and the late Harris Wittels (who died tragically just days before the Parks finale) made this series something truly special. That care is evident in how organically character arcs progressed over the course of the series. Like the vastly under-appreciated King of the Hill, which shares much creative DNA with Parks, characters here evolved and grew, never remaining static and predictable like so many other sitcoms we’ve seen before. As I watched the recent finale, I tried to think of another comedy that has managed to evoke such emotion in me. Parks was always able to hit me in the gut like no other. The Harvest Festival, the city council election, the Unity Concert, Leslie and Ben — each one of these storylines were carefully built toward and executed with precision. And they all stuck their landings. Even when season six dragged on and showed signs of late-series wheel-spinning, there were still high points. Leslie’s ouster from the city council seemed like a misstep. Her subsequent flailing occasionally felt regressive. But the closing few episodes of that season, concluding with the Unity Concert, paid off. Watching that episode right before the series finale last week, I was dumbfounded at how damn good it was — and how a friggin’ hologram of a pony could manage to get me choked up. But it did. That’s Parks. 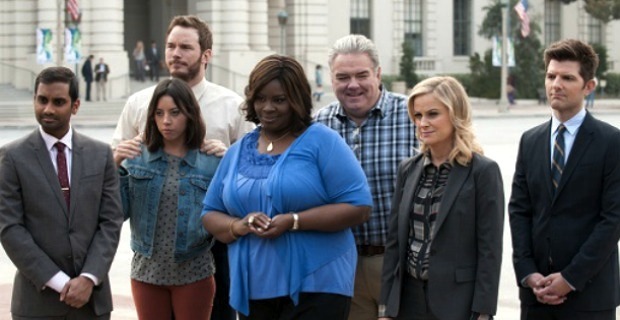 Parks never was the ratings smash successor to The Office NBC had hoped for, but I’d argue that it was that lack of mainstream popularity that allowed it to be so good. Schur pretty much confirmed this in a recent interview with Vulture where he attributed the show’s perpetual status of being “on the bubble” of cancellation as justification to cast off common sitcom rules like drawn-out plotlines and will-they-won’t-they? romances in place of tight storytelling. They just went for it. Leslie and Ben fell in love with little drama. They got married on a whim. They had triplets between seasons. No unnecessary buildup. No wasted plot. That fun is evident throughout season seven, which granted Schur and company 13 episodes to write the Parks final chapter. Jumping ahead to 2017, Pawnee is a bustling, vibrant city. The merger with Eagleton was a success. The local economy is booming thanks to investments from Facebook analogue Gryzzl. Leslie is hard at work running her division of the National Park Service. The Parks Crew, however, is fractured. People have moved on professionally and personally. The show doubles down on the friendship theme with Leslie and Ron’s taking center stage for the first few episodes. Again, Parks doesn’t dither. It manages to burn through a ton of story in just 13 episodes. Any one of them, like Leslie’s conflict with Gryzzl, could have constituted the entire arc of the season. Here, however, that story is resolved early on, allowing for the series to tell a handful of smaller stories that take us on a farewell tour of Pawnee — the most fully-realized fictional town since Springfield. These closing episodes never feel rushed or like a trip down memory lane. Cameos of old characters abound — nearly everyone gets a moment, save Mark Brendanawicz — but it never feels like fanservice or wasted time. Then, there’s the format-busting “Johnny Karate” episode, which gives us the final episode of Andy’s (Chris Pratt) public access kids’ show in real-time, complete with fake commercials from Pawnee businesses like Paunch Burger. It’s ambitious and totally delivers, even managing to provide one of the highpoints in Andy and April’s (Aubrey Plaza) growth as a couple. As we reach the final episode, “One Last Ride,” the Parks Crew is back together. Everyone gathers in the Pawnee Parks Department office to say goodbye before they all head their separate ways when one final parks project presents itself. Leslie being Leslie rallies the gang for one last hurrah to fix a broken swing. That framing device serves as the backdrop for an episode that jumps ahead to multiple points in the future, all the way to 2048. Through these vignettes, we see how everyone’s lives play out, and how they continue to stay involved in each other’s lives. The result, while scattered at times, is expectedly sweet and enjoyable. It’s a fitting goodbye, and a nice nod to the audience who, like me, has invested so much in these characters. The critic in me, however, feels like a straight-ahead episode would have been cleaner and more satisfying. Finales are a tricky thing. They are inevitably scrutinized, and can never please everybody. Part of me wanted them to spend the hour fixing that swing before fading to black — just one more classic Parks story for the road. What we got was slightly heavy on the sentimentality, even for me, but it was still good. Fortunately, it was also heavy on laughs, giving us glimpses into the futures of minor characters like Craig, Typhoon, and, of course, Jean-Ralphio. Minor criticisms aside, the finale still works. Better yet, the entire final season was a delight, providing a proper sendoff to a show and a town we have come to love, and launching the careers of some of the funniest people working in comedy today. For that, we should all be grateful.